Provide comfort for the family of June Cholodnuik with a meaningful gesture of sympathy. It is with great sadness that we announce the passing of June Carol (nee Zolinski) Cholodnuik, late of Prince Albert, SK, on March 4, 2019, at the age of 84 years. June was born in Wakaw, SK to Carl and Ann (nee Zakus) Zolinski on November 8, 1934. She is survived by her children: Trudy (Edward) Hupaelo, Kenneth (Shirley) Cholodnuik and John Cholodnuik; her grandchildren: Dawn (Todd) Devonshire, Jamie (John) Tilley, Richard (Tara) Hupaelo, Jody (Colin) Mills, Steven (Crystal) Hupaelo, Hannah (Cory) Patterson, Robert (Karri) Cholodnuik, Amanda (Steven) Monich, Seth Cholodnuik, Robin (Richard) Bonneau, Mathew (Ena) Cholodnuik, Michael Cholodnuik, Ryleigh Cholodnuik, Tyson Cholodnuik and Blake (Emily) Cholodnuik; her great-grandchildren: Jude, Aden, Bronwyn, Lauryn, Camryn, Austyn, Brinley, Bentley, Orianna, Jahnaya, Sarah, Berkley, William, Sophie, Reba, Madison, Teighlor and Emma; her brothers: Walter (Frances) Zolinski and Tom (Jeannine) Zolinski; and her sisters-in-law: May Hill, Ann Cholodnuik and Marie Cholodnuik. She was predeaced by her husband: Robert Cholodnuik; her son: Keith; her parents: Ann & Carl; her sisters-in-law: Kay Paula and Anne Cholodnuik; her brothers-in-law: Peter, Steve and Martin Cholodnuik; and her step-brothers-in-law: Walter Hryhor, Romie Hryhor and William Hryhor. A Prayer Service will be held on Sunday March 10, 2019 at 7:00Pm at MacKenzie Funeral Chapel located in Prince Albert, SK. A Funeral Service will follow on Monday March 11, 2019 at 10:00AM at St. George’s Ukrainian Catholic church located in Prince Albert, SK. Internement will follow at the Memorial Gardens Cemetery in Prince Albert, SK. To send flowers in memory of June Carol Cholodnuik (Zolinski), please visit our Heartfelt Sympathies Store. 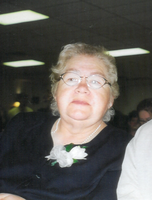 Provide comfort for the family of June Carol Cholodnuik (Zolinski) by sending flowers. My sincere condolences Trudy & Eddy and all your families. My thoughts and prayers are with you all.